First and foremost I will address what the trending and ranking means. What kind of things that the Global Peace Index does and what kind of attributes and recent history means for individual countries. All of this makes violence, homicides, social security, militarization which is part of the evaluation of the scores which makes the Index. The countries that will take on is Burundi, Democratic Republic of Congo, Kenya, Rwanda, South Sudan, Somalia, Tanzania and Uganda. Which have different histories, though they are close to each other? Why are the numbers so far apart? What makes this? We can wonder. But look through what been said in the report and the numbers. “Over the past eight years the average country score deteriorated 2.4 percent, highlighting that on average the world has become slightly less peaceful. However, this decrease in peacefulness has not been evenly spread, with 86 counties deteriorating while 76 improved. MENA has suffered the largest decline of any region in the world, deteriorating 11 per cent over the past eight years (GPI, P: 2). “The economic impact of violence on the global economy in 2014 was substantial and is estimated at US$14.3 trillion or 13.4 per cent of world GDP. This is equivalent to the combined economies of Brazil, Canada, France, Germany, Spain and the United Kingdom. Since 2008, the total economic impact on global GDP has increased by 15.3 per cent, from US$12.4 trillion to US$14.3 trillion” (GPI, P: 3). This section analyses the effects of urbanisation on violence, and finds that peace generally increases with higher levels of urbanisation. This is a by-product of higher levels of development. However, countries that have weak rule of law, high levels of intergroup grievances and high levels of inequality are more likely to experience deteriorations in peace as urbanisation increases” (GPI, P: 3). Since 1990, there has been a slow and steady decrease in measures of global militarisation, with large changes in militarisation occurring rarely and usually associated with larger, globally driven geopolitical and economic shifts” (GPI, P: 3). Indirect cost of violence: Accounts for costs that are not directly related to an act of violence and accrue over the long run. This can include losses of income due to injury or pain or grievance of others who were not directly involved in the crime. Negative Peace: The absence of violence or fear of violence. Positive Peace: The attitudes, institutions and structures which create and sustain peaceful societies. These same factors also lead to many other positive outcomes that support the optimum environment for human potential to flourish. Positive Peace Index (PPI): A composite measurement of Positive Peace based on 24 indicators grouped into eight domains. Resilience: The ability of a country to absorb and recover from shocks, for example natural disasters or fluctuations in commodity prices. Violence containment: Economic activity related to the consequences or prevention of violence where the violence is directed against people or property. The Regional Rank is set for the region of Sub-Saharan Africa. Therefore the regional rank is different from the World Rank. In the World rank it goes from 64 of Tanzania and 159 of South Sudan. That is 100 countries in between in the World, when we talk about peaceful environment and the fear should be one South Sudan (159), Somalia (157) and DRC (155). Tanzania which is on top is the 64. Next place is for Uganda was ranked on 111, the third and fourth country in the region which was near each other was Kenya (133) and Rwanda (139). And the fifth place is Burundi (130) – which I am certain will fall on the rank after the elections in 2015. But for the GPI 2015 there is still high level for the region. On Armed Conflicts and War in Sub-Saharan Africa: “Although sub-Saharan Africa has the highest number of conflicts, these conflicts tend not to last as long as in other regions. There were only three conflicts in sub-Saharan Africa in 2013 which started more than three years ago, two of which are long-standing conflicts in Ethiopia” (GPI, P: 51). On Peacefulness in the region: “In 2008, MENA had the same level of peacefulness as sub-Saharan Africa, and was the 6th most peaceful region in the world. By 2015 it has become the least peaceful region in the world, deteriorating by 11 per cent over the period” (GPI, P: 55). On South Sudan: “South Sudan’s ranking declined by only three places, but this was on top of by far the sharpest fall in the 2014 GPI. It remains embroiled in the civil conflict that broke out in December 2013, and which has thus far proved immune to numerous peace efforts” (…) “South Sudan also fell for its third consecutive year, slipping a further 3 places to 159. (GPI, P: 13, 16). On Somalia: Somalia is on the highest cost of violence percentage of GDP which was 22%. “The majority of” (…) “Somalia’s costs stem from IDPs and refugees and homicides” (…) “The same category represents 54 per cent of Somalia’s total costs. (GPI, P: 77). The difference is staggering from Somalia and South Sudan to the best state of peace in Tanzania. The other countries in between is ranked so close and with scores that could easily point them further down for next year if the militarization and violence inside the countries continue. Like I have a grand feeling that Burundi will fall on the ranking next year, also Uganda with the recent attacks and continuously going against opposition to the Presidential elections in 2016. Rwanda will sure shut down anybody who goes against the third term of Paul Kagame. There are also issues that are meeting Joseph Kabila’s planed third term in Democratic Republic of Congo. Ethiopia is in a stalemate of totalitarian regime that keeps the borders clear and with the resistance that comes from Somalia or the Omoro Liberation Front (OLF). 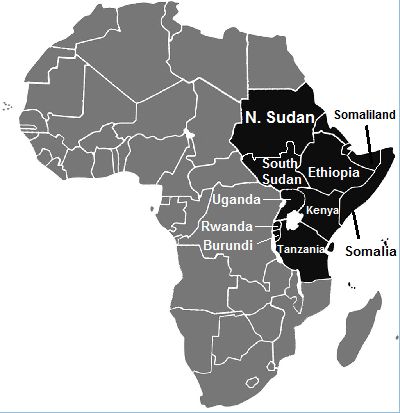 Kenya has issues with building the border to Somalia where they has also taken districts in Somalia. And Kenya has the fear of Al-Shabab after the terrorist attack in Nairobi (2013) and that has happen also in Kampala (2010) in Uganda. Therefore these rankings are important to look at because you can see what the state of ease is at, this is about the peace and impact of the authoritarian and totalitarian regimes in these countries. And will be good to follow and see how it really turns out in the next year rankings from the same place the Institute for Economic and Peace. Hope it’s been a drop of enlightenment for you as well. Peace.